The name already suggests the immense technical potential offered by the DATOGRAPH PERPETUAL TOURBILLON that was launched in 2016: The term DATOGRAPH refers to a flyback chronograph with a precisely jumping minute counter and the typical Lange outsize date. PERPETUAL stands for its perpetual calendar with precisely jumping displays combined with a moon-phase indication calculated to remain accurate for 122.6 years. Finally, the TOURBILLON part alludes to the one-minute tourbillon with patented stop seconds that is visible on the caseback side; it eliminates the influence of gravity on the escapement inside its cage. 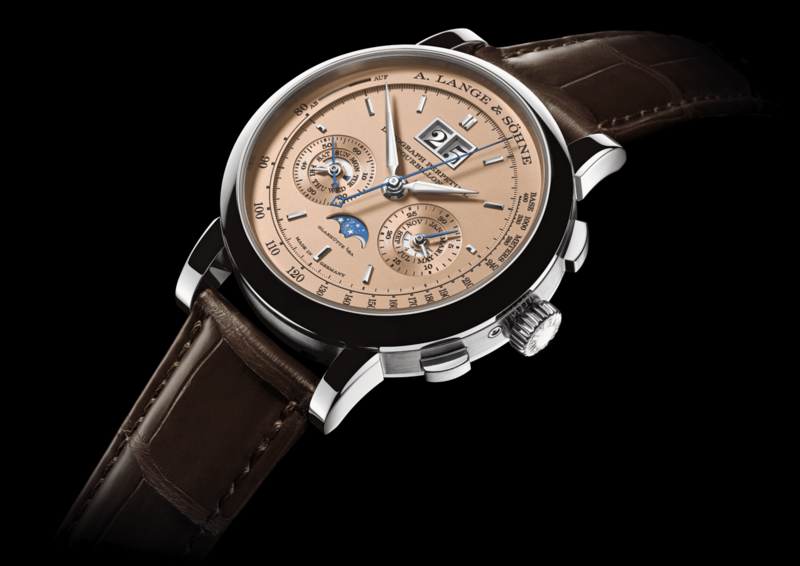 The well-organised arrangement of the time, calendar and chronograph displays is rounded off with a power-reserve indicator at the end of the tachymeter scale. The development of the DATOGRAPH PERPETUAL TOURBILLON is powered by an impres-sive success story that began with the presentation of the first DATOGRAPH in 1999. Its rare combination of a classic column-wheel design, a precisely jumping minute counter and the flyback function attracted considerable attention. The clearly structured dial layout, in which the Lange outsize date and the two subsidiary dials form an equilateral triangle, gave it the status of a timeless icon. This prominent constellation is echoed by the DATOGRAPH PERPETUAL TOURBILLON. Its larger diameter made it possible to enlarge the subsidiary dials that accom-modate the displays of the perpetual calendar. The subsidiary seconds, the day of the week and the day/night indicator are on the left side, while the precisely jumping minute counter, the months, and the leap-year indicator are on the right. Three recessed correctors make it possible to adjust the moon phase, the day, and the month separately. A universal button at 10 o’clock advances all calendar displays collectively. The sapphire-crystal caseback reveals the L952.2 manufacture calibre that consists of 729 parts. 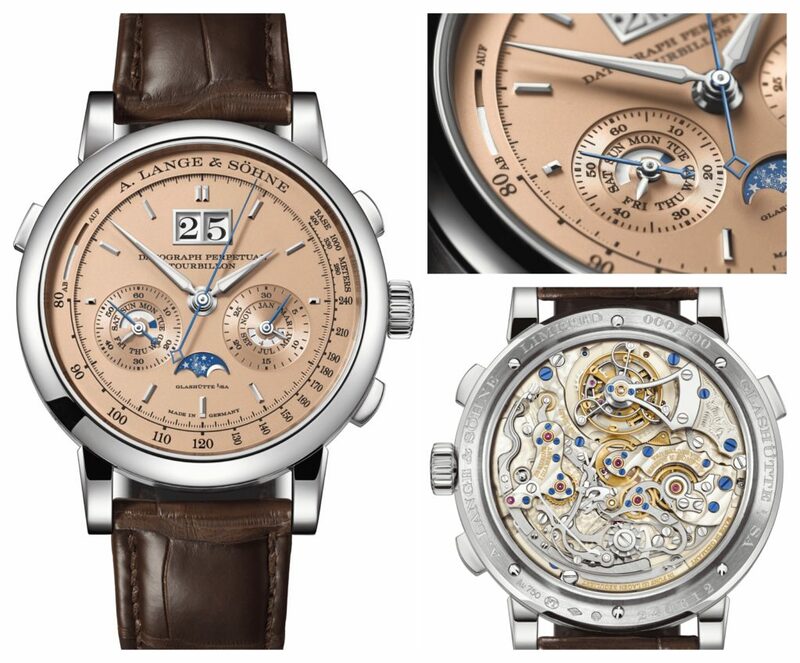 Finished manually down to the last detail, its complexity reflects the ambition of A. Lange & Söhne to continue to redefine the limits of mechanical watchmaking.